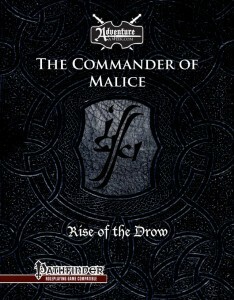 Get the Rise of the Drow 500 page setting/adventure book, Rise of the Drow Prologue: The Darkness Arrives, Rise of the Drow Epilogue: The Commander of Malice, and Rise of the Drow: Player’s Guide on sale in a PDF bundle for a limited time. Obtain information on Rybalka and the surrounding environs, meet important NPCs, hear local rumors, and discover new races! 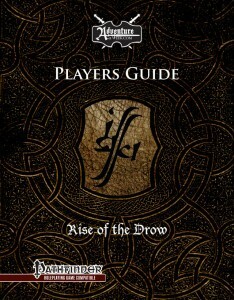 The Rise of the Drow Player’s Guide is the perfect introduction to the incredible adventure trilogy and brings everything you need to know to join in the game! The appearance of the village, the party’s intended destination, seems perfectly timed. The locals are heading for the central cathedral and talk of warmth, light, and succor while encouraging everyone to, “get out of the darkness.” Following this advice, the adventurers find themselves in the middle of a service to mark the ending of the longest night and a return to the comfort of daylight—thanks to an ancient relic. 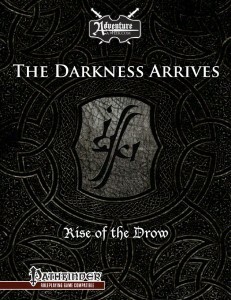 A three part story spanning over 120 pages by the authors of Rise of the Drow, Tears at Bitter Manor, and the Saatman Throne Adventure Path. After the final battle in the drow’s home, the party’s foe once again finds an escape route and despair would be an easy emotion to feel—but the portal the villainous priestess used to evade the PCs after the final assault is still active, if heavily damaged, and restoring it gives one way to follow their enemy to wherever she has fled! Pulses of sickly, acid-green light from pieces of the circle of stones tell the adventurers what their next step might be, but will they follow the fleeing essence of the priestess? First the PCs must prepare themselves after their recent hard-fought successes, and gather together the fragments of the gate to rebuild and activate it. Only then can they make their pursuit—that almost certainly means further effort from the party themselves, and possibly those around them. How many more sacrifices must those opposed to the drow make to defeat them once and for all? This may be the adventurers’ final one, as they enter the home of the Queen of Venom for one final confrontation! 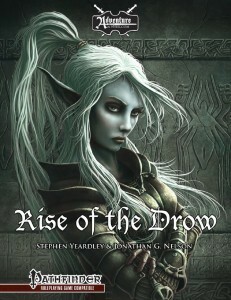 Be the first to review “Rise of the Drow Bundle (PDF)” Click here to cancel reply.